The ThinkSystem SD650 direct water cooled server is an open, flexible, and simple data center solution for users of technical computing, grid deployments, analytics workloads, and large-scale cloud and virtualization infrastructures. The direct water cooled solution is designed to operate by using warm water, up to 50°C (122°F). Chillers are not needed for most customers, meaning even greater savings and a lower total cost of ownership. The ThinkSystem SD650 server and NeXtScale n1200 WCT enclosure are designed to optimize density and performance within typical data center infrastructure limits. The n1200 WCT enclosure is a 6U rack mount unit that fits in a standard 19-inch rack and houses up to 12 water-cooled servers in 6 trays. This product guide provides essential pre-sales information to understand the SD650 server, its key features and specifications, components and options, and configuration guidelines. This guide is intended for technical specialists, sales specialists, sales engineers, IT architects, and other IT professionals who want to learn more about the SD650 and consider its use in IT solutions. The ThinkSystem SD650 server and the n1200 DWC enclosure are designed to optimize density and performance within typical data center infrastructure limits. The n1200 DWC enclosure is a 6U rack mount unit that fits in a standard 19-inch rack and houses up to 12 water-cooled servers in 6 trays. The two ThinkSystem SD650 servers are shown installed in a tray in the following figure. The ThinkSystem SD650 server and n1200 DWC enclosure with direct water cooling provide the ultimate in data center cooling efficiencies and performance. You can obtain upwards of 40% energy savings in data center expenses with the reduced need for air conditioning and air chillers. Direct water cooling means that the processors installed in the servers can enable the Intel Turbo Boost performance feature more often to further increase processor performance. The ThinkSystem SD650 direct water cooled offering is a dense platform from Lenovo that achieves maximum performance with innovative warm-water cooling functionality. The DWC offering includes a dense chassis and two half-wide compute nodes on a compute tray, all fitting in a standard rack. With direct water cooling, Lenovo drives increased compute density, performance, and cooling efficiency for High Performance Computing and other workloads that require dense compute performance, such as Cloud, Grid, and Analytics. Direct water cooling is achieved by circulating the cooling water directly through cold plates that contact the CPU thermal case, DIMMs, and other high-heat-producing components in the server. One of the main advantages of direct water cooling is the water can be relatively warm and still be very effective, as water conducts heat much more effectively than air. Depending on the server configuration, 85 - 90% of the heat is removed by water cooling; the rest can easily be managed by a standard computer room air conditioner. With allowable inlet temperatures for the water being as high as 50°C (122°F), in many cases the water can be cooled by using ambient air and chilled water and a heat exchanger is not required. 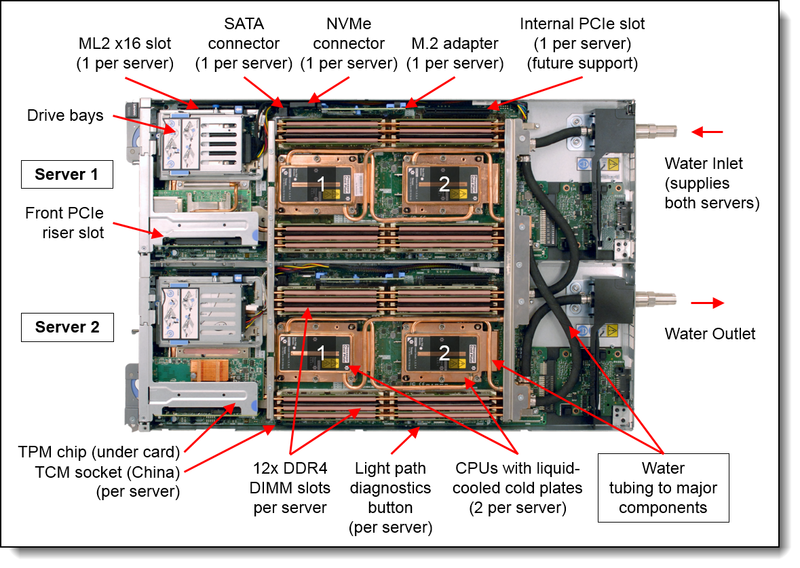 The rear view of the two ThinkSystem SD650 servers in the water-cooled tray is shown in the following figure. Designed to industry-standards, the SD650 is a general-purpose platform that is designed to give customers a flexible IT infrastructure. Customized solutions can be configured to provide an application-appropriate platform with a choice of servers, networking switches, adapters, and racks. ThinkSystem SD650 servers provide a dense, flexible solution with a low TCO. The half-wide, dual-socket server is designed for data centers that require high performance but are constrained by floor space. 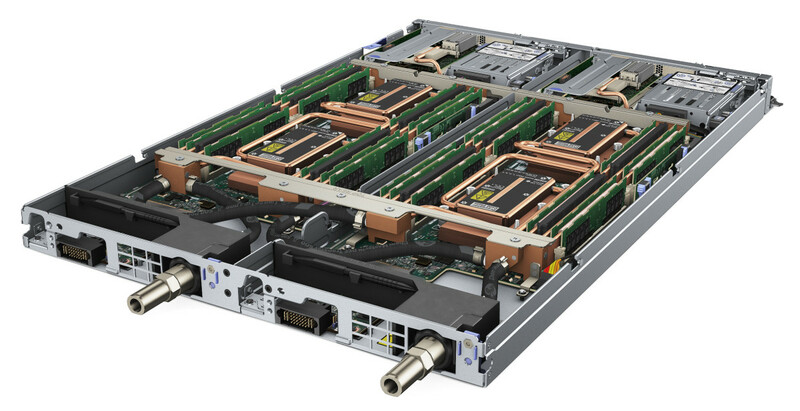 By taking up less physical space in the data center, the SD650 enhances density and supports the Intel Xeon Scalable Family of processors up to 28 cores and 205 W TDP. The SD650 is designed to support future processors of up to 245 W, thus providing for even more performance per server. The SD650 contains only essential components in the base architecture to provide a cost-optimized platform. The NeXtScale n1200 DWC Enclosure is an efficient, 6U, 12-node chassis with no built-in networking or switching capabilities; therefore, it requires no chassis-level management. Sensibly designed to provide shared, high-efficiency power and cooling for housed servers, the n1200 DWC enclosure is designed to scale with your business needs. Up to 12 compute nodes, each with two of the latest Intel Xeon Scalable Family processors, 12 TruDDR4 DIMMs, and one PCIe slot, up to two drive bays, in 6U of rack space. It is a highly dense, scalable, and price-optimized offering. The Intel Xeon Scalable Family processors improves productivity by offering superior system performance. Supported processors have up to 28 cores, core speeds of up to 3.9 GHz, L3 cache sizes of up to 38.5 MB, DDR4 memory operating at 2666 MHz, and UPI interconnect links running at 10.4 GTps. Two processors, up to 56 cores, and up to 112 threads maximize the concurrent execution of multi-threaded applications. By providing better cooling than possible with air cooling, direct water cooled servers optimize Turbo Boost 2.0 enablement. With water cooling, it may be possible to operate the processors in continuous Turbo mode. Intel Advanced Vector Extensions 512 (AVX-512) enable acceleration of enterprise-class workloads, including databases, and enterprise resource planning. Supports "F"-suffix processors with embedded PCIe x16 Omni Path fabric for high-performance networking with a lower-cost OPA implementation. Each processor has six memory channels with memory speeds of up to 2666 MHz to maximize system performance. A total of 12 DIMMs of registered 2666 MHz TruDDR4 ECC memory provide speed, high availability, and a memory capacity of up to 1.5 TB. One full-height half-length PCIe 3.0 x16 slot. Supports an Intel Omni-Path Architecture (OPA) adapter or Mellanox ConnectX-5 VPI adapter delivering ultra-high performance connectivity. One mezzanine LOM Generation 2 (ML2) slot, with a x16 PCIe 3.0 host interface. The ML2 slot supports NC-SI for out-of-band systems management. Supports SATA or NVMe SSDs drives to maximize I/O performance in terms of throughput, bandwidth, and latency. The use of solid-state drives (SSDs) instead of, or along with, traditional hard disk drives (HDDs) can improve I/O performance. An SSD can support up to 100 times more I/O read operations per second (IOPS) than a typical HDD. PCI Express 3.0 I/O expansion capabilities improve the theoretical maximum bandwidth by 60% compared with the previous generation of PCI Express 2.0. Water cooling eliminates power that is drawn by cooling fans in the chassis and dramatically reduces the required air movement in the server room, which also saves power. Savings as much as 40% are possible in the data center due to the reduced need for air conditioning. Water chillers may not be required with a direct water cooled solution. Chillers are a major expense for most geographies and can be reduced or even eliminated because the water temperature can now be 50°C instead of 18°C in an air-cooled environment. 85-90% heat recovery is possible with the DWC design. Heat energy absorbed may be reused for heating buildings in the winter for further operating expense savings. The processors and other microelectronics are run at lower temperatures because they are water cooled, which uses less power. 80 Plus Platinum and Titanium power supplies ensure energy efficiency. Intel Intelligent Power Capability can power on and off individual processor elements as needed to reduce power draw. Low-voltage 1.2 V DDR4 memory DIMMs use up to 20% less energy than 1.35 V DDR3 DIMMs. Supports Secure Boot to ensure only a digitally signed operating system can be used. Supported on standard drives as well as M.2 drives in the M.2 Adapter. The n1200 DWC chassis includes drip sensors that monitor the inlet and outlet manifold quick connect couplers; leaks are reported via the Fan and Power Controller (FPC). The NeXtScale n1200 DWC chassis supports N+N and N+1 power policies for its six power supplies, which means greater system uptime. The power supplies are hot-swappable. Toolless cover removal provides easy access to upgrades and serviceable parts, such as adapters and memory. Proactive Platform Alerts (including PFA and SMART alerts): Processors, voltage regulators, memory, internal storage (HDDs and SSDs, NVMe SSDs, M.2 storage), fans, power supplies, and server ambient and subcomponent temperatures. Alerts can be surfaced through the XClarity Controller to managers such as Lenovo XClarity Administrator and other standards-based management applications. These proactive alerts let you take appropriate actions in advance of possible failure, thereby increasing server uptime and application availability. The XCC offers optional remote management capability and can enable remote keyboard, video, and mouse (KVM) control and remote media for the server. There is a three-year customer replaceable unit and onsite limited warranty, with next business day 9x5 coverage. Optional warranty upgrades and extensions are available. With water cooling, system fans are not required; only small power supply fans operate. This results in significantly reduced noise levels on the data center floor, a significant benefit to personnel having to work on site. The front of the SD650 tray (two servers) is shown in the following figure. The compute nodes are installed in the NeXtScale n1200 DWC enclosure, as shown in the following figure. The rear of the enclosure contains the power supplies, cooling water manifolds, and the Fan and Power Controller, as shown in the following figure. The following figure shows the architectural block diagram of the SD650, showing the major components and their connections. The following table lists the standard specifications of the SD650 server. Form factor Half-wide, 1U server. 2 server per full wide 1U compute tray. Processor Each server: Two Intel Xeon Processor Scalable Family of processors, either Gold or Platinum level processors (formerly codename "Skylake"). Supports processors with up to 28 cores, core speeds up to 3.9 GHz, and TDP ratings up to 205W. Supports "F"-suffix processors with embedded Omni Path fabric. Memory Each server: 12 DIMM sockets (6 DIMMs per processor). Lenovo TruDDR4 RDIMMs, LRDIMMs and 3DS RDIMMs are supported. Each processor has 6 memory channels, with 1 DIMM per channel. In addition, the server supports M.2 drives with the addition of an M.2 adapter. Note: Drive bays are mutually exclusive with the use of the ML2 slot. Maximum internal storage Each server: 3.84 TB using two 1.92 GB Enterprise Mainstream SATA 2.5" SSDs. One Gigabit Ethernet port with an RJ45 connector, based on the Intel Ethernet Connection X722, shared between the operating system and the XClarity Controller (XCC) management processor. One Gigabit Ethernet port dedicated for use with the XCC management processor. One ML2 x16 front-accessible slot with riser card. Supports NC-SI. Ports Front of the server: KVM connector; with the addition of a console breakout cable (1 cable standard with the chassis) supplies one RS232 serial port, one VGA port, and two USB 1.1 ports for local console connectivity. Two 1 Gbps Ethernet ports with RJ45 connectors (one dedicated to the XCC managment processor). 10/100 Mb Ethernet port for use with the Fan and Power Controller at the rear of the chassis. Systems management Operator panel with status LEDs. Light path diagnostics for local failure detection and reporting. XClarity Controller embedded management, XClarity Administrator centralized infrastructure delivery, XClarity Integrator plugins, and XClarity Energy Manager centralized server power management. Optional XClarity Controller Advanced to enable remote control functions. Red Hat Enterprise Linux and SUSE Linux Enterprise Server. See the Operating system support section for specific versions. Dimensions Compute tray width:432 mm (17 in. ), height: 41.0 mm (1.6 in. ), depth: 658.8 mm (25.9 in.). The NeXtScale n1200 DWC enclosure provides shared high-efficiency power supplies. The SD650 trays connect to the midplane of the n1200 enclosure. This midplane connection is for power and control only; the midplane does not provide any I/O connectivity. The following table lists the standard specifications of the enclosure. Form factor 6U rack-mounted chassis. Maximum number of servers supported Up to 12 compute nodes (2 compute nodes on 1 compute tray) per chassis. Midplane Passive midplane provides connections to the 12 servers in the front to the power supplies and fans at the rear. Provides signals to control fan speed, power consumption, and node throttling as needed. Fan and Power Controller The FPC module is the management device for the chassis. Provides integrated systems management functions and controls the power and cooling features of the enclosure. Hot-swappable. Browser and CLI-based user interfaces for remote access via the dedicated 10/100 Mbps Ethernet port. Internal USB memory key for logging and configuration data. Ports RJ45 port on the rear of the chassis for 10/100 Ethernet connectivity to the FPC for power and cooling management. Each server has RJ45 Ethernet connectors as well as a KVM connector for USB, video and serial connections. I/O architecture None integrated. Use top-of-rack networking and storage switches. Power supplies Up to six hot-swap power supplies either 1300 W, 1500 W, or 2000 W. Power supplies installed at the rear of the chassis. Single power domain supplies power to all servers. Optional redundancy (N+1 or N+N) and oversubscription. Integrated 2500 RPM fan. 80 PLUS Platinum certified (1300 W power supply also available as Titanium certified). Built-in overload and surge protection. Cooling Direct water cooling supplied by water manifolds connected from the rear of the chassis. Lower-power internal components cooled by power supply fans. System LEDs FPC LEDs: Power, Activity, Locator, System error log, Ethernet port LEDs. Power supply LEDs: AC power, DC power, Fault LEDs. Servers have more LEDs. Security features Login password for remote connection. Secure Sockets Layer (SSL) security for remote management access. Supports LDAP for authorization. Trusted and signed firmware. Systems management Browser-based chassis management through an Ethernet port on the FPC at the rear of the enclosure. Servers provide more management features. Note: The minimum inlet water temperature is data center dependent, that is, the dew point at which condensation occurs. A minimum of 2°C is supported provided ambient air conditions are not such that condensation will occur. A minimum of 18°C is recommended. See Operating Environment for more information. There are no standard SD650 models; all servers must be configured by using the configure-to-order (CTO) process. The ThinkSystem SD650 machine type is 7X58. There are no standard models of the water-cooled chassis; all NeXtScale n1200 DWC chassis must be configured by using the CTO process. The machine type is 5468. The water manifold a separate machine type 5469. The SD650 supports the processors that are listed in the following table. Two processors must be selected - the server is not supported with only one processor installed. Certain processors (those with an "F" suffix) have an embeded Omni Path Architecture (OPA) fabric in the processor. To make use of this embedded fabric, an Intel Omni Path Internal Faceplate Transition (IFT) Interposer Card must be installed and connected to the processor. The IFT adapter is described in the Network adapters section. Each SD650 server has 12x TruDDR4 DIMM slots, as shown in the following figure. The SD650 uses Lenovo TruDDR4 memory operating at 2666 MHz. The server supports 12 DIMMs with two processors installed, 6 DIMMs per processor. Each processor has six memory channels with 1 DIMM per channel. With 12x 64 GB LRDIMMs, each server supports up to 768 GB of memory. In addition to the 12 TruDDR4 DIMM slots, the server has 4 additional DIMM slots reserved for future use. The DIMMs supported with the SD650 server are listed in the following table. The SD650 server supports one or two 2.5-inch drives internally in each server. These are Simple-Swap drives that are not front accessible so will require both servers in the tray to be powered off and the tray removed from the chassis before replacing the drives. The following figure shows two 7mm drives installed in a drive cage. See the Components and connectors section for the location of the drive bays. Supported drives are listed in the following table. The table also lists the drive cage that is required to mount the drive in the server. Internal drives and ML2 adapters: The use of the internal drive bays is mutually exclusive with the use of the ML2 slot. In addition, the SD650 supports M.2 adapters and drives, similar to other servers in the ThinkSystem portfolio. The M.2 adapter is installed in a dedicated slot on the system board. The M.2 drives attach to the adapter: the single M.2 adapter supports 1 drive and the dual M.2 adapter supports two drives and supports RAID-0, RAID-1, or JBOD. Note: When the dual M.2 adapter is selected, only 32GB M.2 drives can be used. The 128GB M.2 drives are not supported with the dual M.2 adapter when installed in the SD650. The following table lists the supported M.2 adapters and drives. The SD650 does not support internal tape drives. The SD650 server supports the external USB optical drive option listed in the following table. ML2 adapters and internal drives: The use of the ML2 slot is mutually exclusive with the use of the internal drive bays. The front accessible slots are shown in the following figure. To use the front-accessible slots, the riser cards listed in the following table is required. The server offers one Gigabit Ethernet port with an RJ45 connector, based on the Intel Ethernet Connection X722, shared between the operating system and the XClarity Controller (XCC) management processor. The second standard Gigabith Ethernet port is reserved for systems management. The server supports high-speed network adapters in the front-accessible full-height half-length PCIe slot and the ML2 slot. Supported adapters are listed in the following table. The use of an adapter in these slots also requires the installation of a riser card. The SD650 server offers three Omni Path Architecture solutions. Feature AU0B is a standard PCIe x16 OPA adapter with an air-cooled headsink, whereas feature B21S is the same adapter but with a cold plate and copper tubing that connects to the water infrastructure of the server. Select feature B21S in your configuration when you want to maximize heat recovery through water cooling, rather than relying on room airconditioning. A third OPA offering is the IFT Interposer Card (feature B1C3), an Intel Omni Path Internal Faceplate Transition (IFT) Carrier Card which provides the mechanism to route the OPA fabric that is embedded in Intel Xeon Processors with an F suffix. The Interposer Card is installed in the front-accessible PCIe slot. The use of the IFT Carrier Card is an overall lower cost solution for implementing Omni Path Architecture compared to one of the traditional OPA adapters, however under some conditions, there may be a performance impact on the processor. Feature B1C3 includes three cables: Two cables are routed to the Interposer Card from each processor - the cables are connected directly into the processors. An additional third sideband cable attaches to the Interposer Card from the system board. Note: The use of the IFT Interposer Card requires F-suffix processors (embedded fabric) be installed. See the table of supported processors in the Processor options section. The following figure shows the IFT Interposer Card connected to each of the two F-suffix processors (the sideband cable is not shown). The SD650 server currently does not support storage host bus adapters. The SD650 server currently does not support Flash storage adapters. The SD650 server currently does not support GPUs. One of the most notable features of the ThinkSystem SD650 offering is direct water cooling. Direct water cooling (DWC) is achieved by circulating the cooling water directly through cold plates that contact the CPU thermal case, DIMMs, and other high-heat-producing components in the server. One of the main advantages of direct water cooling is the water can be relatively warm and still be effective because water conducts heat much more effectively than air. Depending on the server configuration, 85-90% of the heat is removed by water cooling; the rest can be easily managed by a standard computer room air conditioner. Allowable inlet temperatures for the water can be as high as 50°C (122°F). In most climates, water-side economizers can supply water at temperatures below 50°C for most of the year. This ability allows the data center chilled water system to be bypassed thus saving energy because the chiller is the most significant energy consumer in the data center. Typical economizer systems, such as dry-coolers, use only a fraction of the energy that is required by chillers, which produce 6-10 °C (43-50 °F) water. The facility energy savings are the largest component of the total energy savings that are realized when the SD650 is deployed. The advantages of the use of water cooling over air cooling result from water’s higher specific heat capacity, density, and thermal conductivity. These features allow water to transmit heat over greater distances with much less volumetric flow and reduced temperature difference as compared to air. For cooling IT equipment, this heat transfer capability is its primary advantage. Water has a tremendously increased ability to transport heat away from its source to a secondary cooling surface, which allows for large, more optimally designed radiators or heat exchangers rather than small, inefficient fins that are mounted on or near a heat source, such as a CPU. 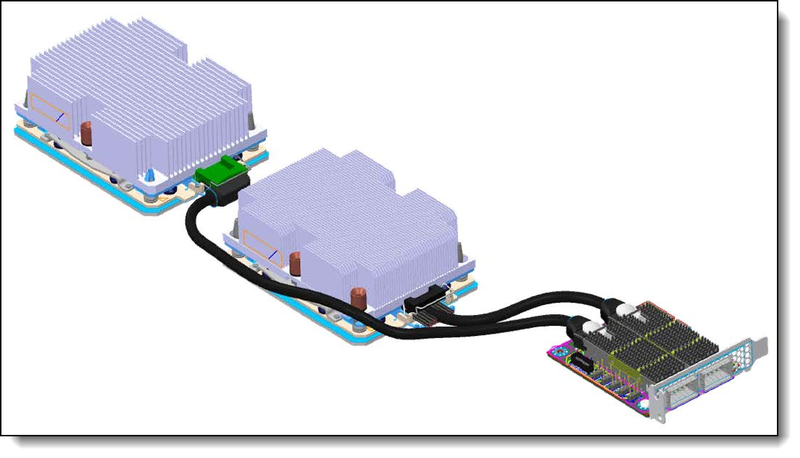 The ThinkSystem SD650 offering uses the benefits of water by distributing it directly to the highest heat generating server subsystem components. By doing so, the offering realizes 7% - 10% direct energy savings when compared to an air-cooled equivalent. That energy savings results from the removal of the system fans and the lower operating temp of the direct water-cooled system components. The direct energy savings at the chassis level, combined with the potential for significant facility energy savings, makes the SD650 an excellent choice for customers that are burdened by high energy costs or with a Green mandate. Water is delivered to each of the nodes from a chiller distribution unit (CDU) via the water manifold. 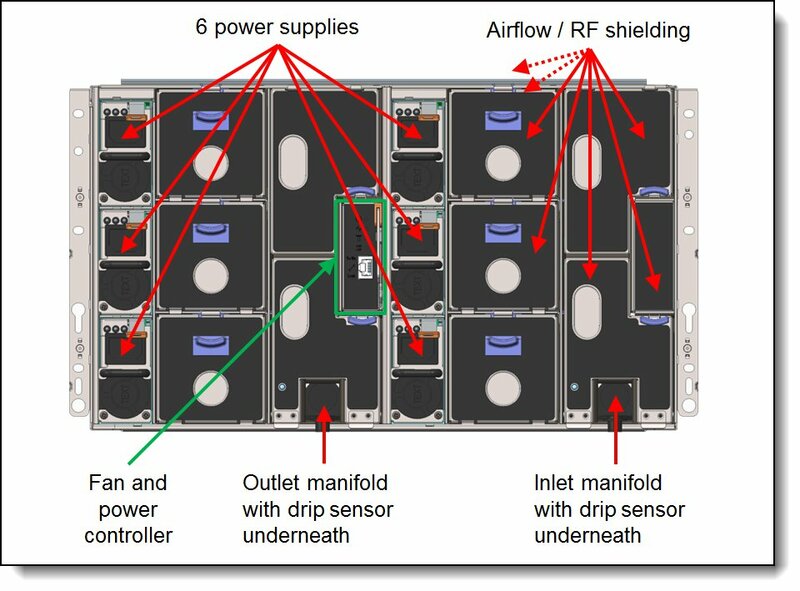 As shown in the following figure, each manifold section attaches to a chassis and connects directly to the water inlet and outlet connectors for each compute node to safely and reliably deliver water to and from each Compute Tray. 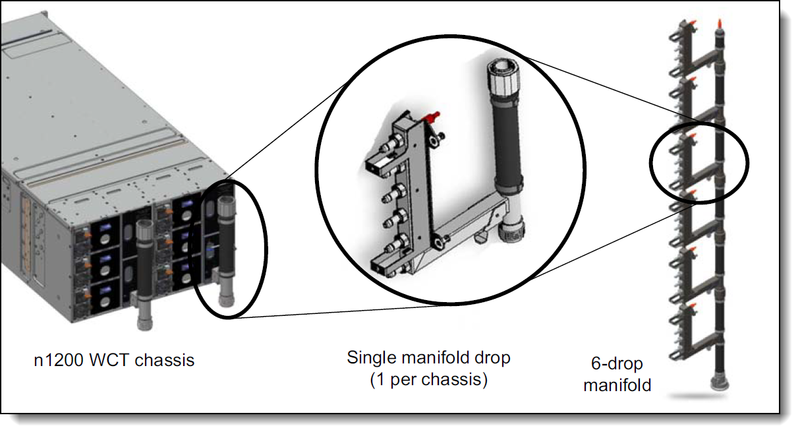 The DWC Manifold is modular and is available in multiple configurations that are based on the number of chassis drops that are required in a rack. The Manifold scales to support up to six Enclosures in a single rack, as shown in the following figure. The water flows through the SD650 as shown in the following animation. The inlet water is split into two parallel paths, one for each server in the tray. Each path is then split further, one for the processors and one for the memory, drives and PCIe adapter. The NeXtScale n1200 DWC enclosure supports up to six redundant hot-plug power supplies, which provides N+N or N+1 redundancy. Power policies with no redundancy also are supported. These power supplies are either 80 PLUS Platinum or Titanium certified to allow for the best efficiency values of your data center. The following table lists the supported power supplies. The SD650 provides local console access through the KVM connector at the front of the server. A console breakout cable is used with this connector, which provides a VGA port, two USB ports, and a DB9 serial port. The cable is shown in the following figure. One console breakout cable is shipped with the NeXtScale n1200 DWC enclosure. Additional cables can be ordered per the following table. When an error occurs, the system error LED lights up. Review the logs through the web interface of the XClarity Controller (see the Remote server management section). If needed, power off the server and remove it from the enclosure. Then, press and hold the light path diagnostics button to activate the system board LEDs (see Figure 4 for the location of the button). The LED next to the failed component then lights up. Note: The server does not support local management using XClarity Mobile running on a tethered smartphone or table. The SD650 contains an integrated service processor, XClarity Controller (XCC), which provides advanced service-processor control, monitoring, and alerting functions. 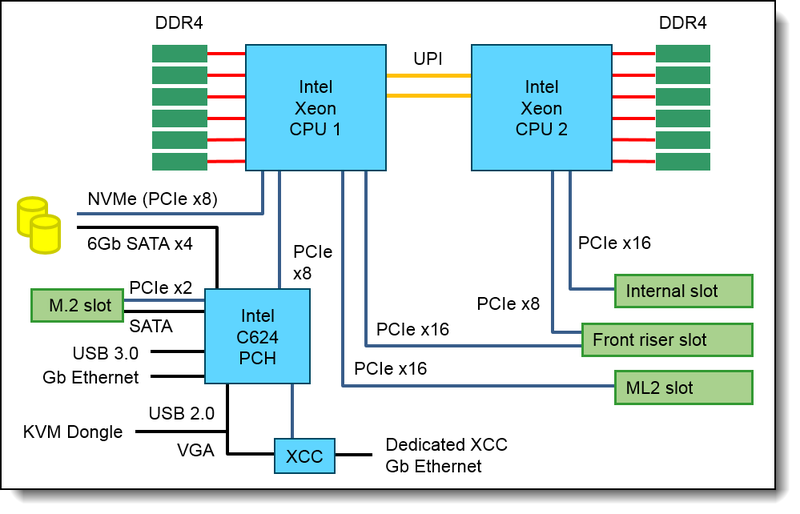 The XCC is based on the Pilot4 XE401 baseboard management controller (BMC) using a dual-core ARM Cortex A9 service processor. An Ethernet port that is dedicated for remote management, connected directly the XCC. An Ethernet port that is shared between the operating system and remote management. The shared-NIC functionality can be enabled or disabled in the server's UEFI panels. The NeXtScale n1200 DWC Enclosure offers a remote management capability through the Fan and Power Controller (FPC), which is at the back of the enclosure, as shown in the following figure. The Fan and Power Controller has one external RJ45 port, which provides a 10/100 Mbps Ethernet connection for browser-based remote control. The FPC also includes a USB key that is housed inside the unit. The USB key stores the event log for the FPC plus power, cooling, and network configuration data. 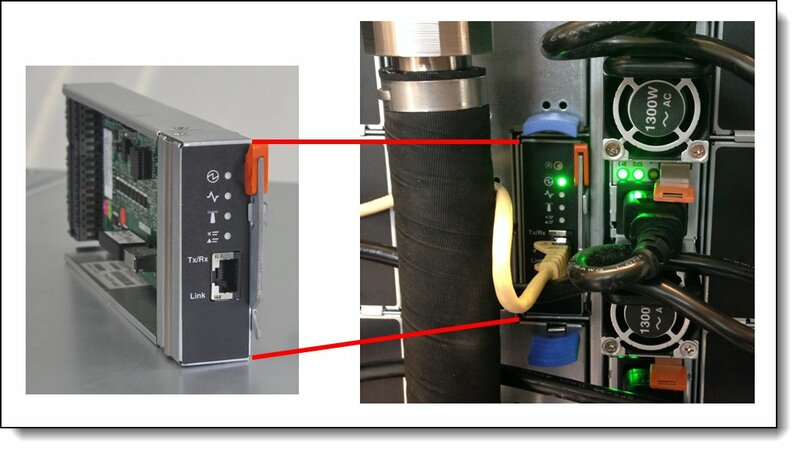 The TCM module, available only for China customers, is installed in a dedicated socket on the system board, as shown in Figure 4. Ordering information is shown in the following table. Note: The water required to initially fill the system side cooling loop must be reasonably clean, bacteria- free water (<100 CFU/ml) such as de-mineralized water, reverse osmosis water, de-ionized water, or distilled water. The water must be filtered with an in-line 50 micron filter (approximately 288 mesh). The water must be treated with anti-biological and anti-corrosion measures. Operating: ASHRAE class A2: 10°C - 35°C (50°F - 95°F); when the altitude exceeds 900 m (2953 ft), the maximum ambient temperature value decreases by 1°C (1.8°F) with every 300 m (984 ft) of altitude increase. If inlet water temperature is 45°C, then the ambient air temperature cannot exceed 27°C. If inlet water temperature is 30°C, then the ambient air temperature cannot exceed 35°C. ActiveX® and Microsoft® are trademarks of Microsoft Corporation in the United States, other countries, or both.